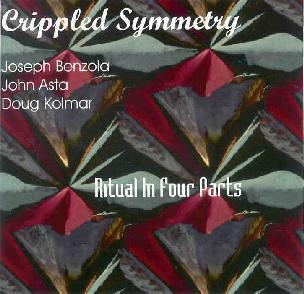 Crippled Symmetry - "Ritual In Four Parts"
Crippled Symmetry is a trio composed of Joseph Benzola on drums, percussion, electronics, piano, shenai, and bamboo flute, John Asta on drums, electronic and acoustic percussion, and Doug Kolmar on guitar and electronics. Long-time AI readers will know Benzola whose solo works we've covered in the past. Benzola composed all the music so it's no surprise that this is similar to the music on his solo recordings. Though he considers himself primarily a drummer, Benzola is equally adept at the keyboards and electronics play an important role in his music. So it's nice to hear him performing in a "band" situation as the dual percussion, additional electronics, and guitar make the music sound more like an orchestra. The music is busy and varied, though totally controlled throughout. Percussion is the dominant presence, though the electronics and guitar serve far more than embellishing roles. On the 50 minute "Ritual In Four Parts" suite, multiple ethnic influences are apparent, and they form the basis and direction for a conglomeration of modern avant-garde composition and jazz. Part III of the Ritual is my favorite as it includes some killer freakout sections between the guitar and electronics that remind me of Sun Ra at his wildest. It isn't until this point that we get to hear Kolmar's guitar really come to the forefront and at one point takes on something of an acidic McLaughlin/Mahavishnu sound. The drummers also break serious sweats as they blast off into rocking jazz territory. And I really dig the parts where the electronics simulate a wild Coltrane styled free-jazz solo. I was fortunate to hear this composition performed live as Benzola shared with me a recording of Crippled Symmetry's show at the Ought One Festival in Vermont this past August, a genuinely tasty treat as he rarely performs live or with other musicians. On "Part III" (a separate track from the parts of the Ritual), evenly paced percussion patterns begin their journey as ear piercing electronics scream. But this is only momentary and the Sun Ra keys soon kick in at a frantic pace that evolves into an electronic sax freakout. Probably the most gorgeously manic ten minutes on the CD. "Part IV" is a relatively short, but very dark piece that brings to mind the avant-rock of Univers Zero placed in a free-jazz setting. And "Unity", the closing track, is a Benzola solo piece that features the beautiful mixture of varied jazz percussion and experimental electronics that makes his music so exciting. Love that heavy wah'd organ! In summary, the music on Ritual In Four Parts is as much on the cutting edge of modern composition and performance as Benzola's earlier works, and there's lots here to appeal to fans of avant garde jazz and even classical music. And fans of high energy adventurous rock music who have been tentative about exploring jazz would do well to check this out as you'll experience the same roller coaster ride effect that rock produces. For more information you can visit the Joseph Benzola web site at: http://web.mac.com/jbenzola/iWeb/amanitamusic.